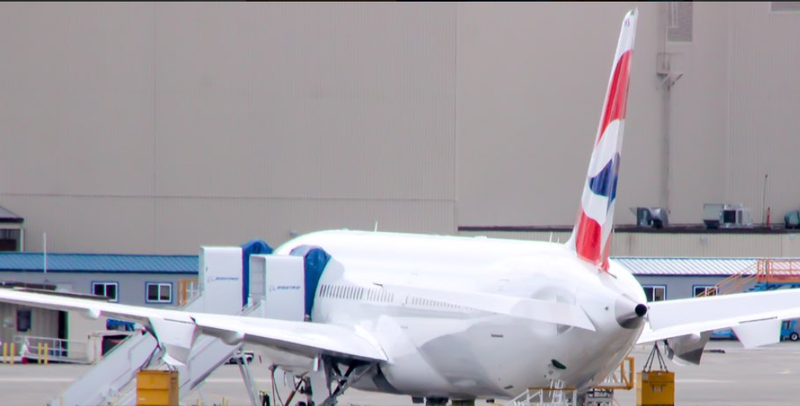 British Airways Boeing 787 without engines on the Boeing Paine Field line. Photo taken April 12 by Jennifer Schuld. April 14, 2018, © Leeham News: An airworthiness directive from the US Federal Aviation Administration is expected as early as Tuesday that could severely restrict flight operations some of Rolls-Royce-powered Boeing 787s. Until the AD is issued and published, the numbers and conditions could change, one source tells LNC on background. EASA, the European safety agency, issued its AD yesterday, with an April 20 effective date. About 25% of the 787s are powered by Rolls-Royce engines, but not all engines are affected. Affected airlines and the Boeing sales force are calling lessors, scrambling for any available aircraft, regardless of equipment type, to cover grounded aircraft or those anticipated to be grounded, the sources tell LNC. There are about 30 787s already ground and perhaps as many as 50, sources say. LATAM has a reported six airplanes on the ground at Victorville (CA). 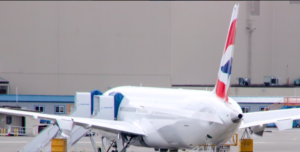 One airline tells LNC that Rolls-Royce warned it to expect a 40%-50% failure rate of the affected RR-powered 787 fleet. This will almost certainly result in grounding the planes, multiple sources tell LNC. The failed inspections may result in doubling the current groundings in the coming weeks, aviation industry sources say. “Boeing continues to work closely with Rolls-Royce to ensure we deliver 787s and support our customers’ needs,” Boeing wrote in an email to LNC. Several airlines, including Air New Zealand, LatAm, Norwegian and Virgin Atlantic, leased in aircraft to cover their current groundings. Some of these are wet leases (with crews) and others are dry leases (no crew, operated by the airline’s staff). Etihad and Emirates airlines are said to be offering to wet lease some airplanes. Etihad is in contraction mode, downsizing significantly as it tries to work through huge losses. Emirates also has surplus capacity due to market conditions. 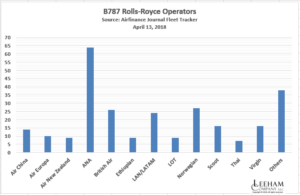 There are 269 RR-powered 787s in service, according to the Airfinance Journal Fleet Tracker. Japan’s ANA is the largest operator, with 64, followed by Norwegian Air Shuttle with 27 and LAN/LATAM with 24. Scoot and Virgin Atlantic each have 16. 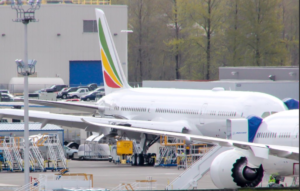 Ethiopian Airlines Boeing 787 on the line at Paine Field, without engines. Photo taken April 12, 2018, by Jennifer Schuld. Initially, Boeing wasn’t diverting engines from the production lines to airlines with aircraft on the ground (AOG), airlines complained to LNC. One airline contrasted Boeing’s action to Airbus, which directed Pratt & Whitney to divert new production Geared Turbo Fan engines to customers with AOG instead of to the production lines. A320neos litter the Toulouse (and probably Hamburg) airport with engineless A320neos. This appears to have changed. 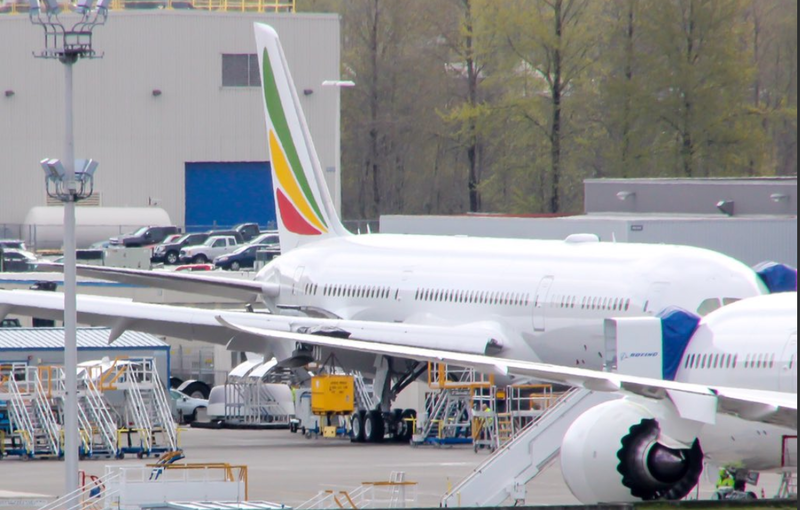 Pictures circulated on Friday on Twitter of four 787s without engines on the ramp at Everett (WA), home to one of the two 787 production sites: one each for British Airways, Ethiopian, LOT and Royal Brunei. Additionally one airplane for Scoot is at Boeing’s Charleston factory parked outside without engines. Two more, unpainted, are also without engines. This action pre-dates the anticipated AD. At least one airline with 787s in production wants the engines diverted to its AOG. “Last month Rolls-Royce, in conjunction with European regulator EASA, issued a directive requiring operators of a type of Trent 1000 engine known as ‘Package C’ to carry out earlier than usual maintenance checks on a specific part of the engine compressor. “This check was already required prior to the engine reaching a flying threshold of 2000 cycles (one way journeys). The directive reduces that timeframe to 300 cycles. Rolls-Royce advises 380 engines globally are impacted by the directive, including nine in the Air New Zealand 787 fleet. Inspection needed BEFORE next ETOPs flight …. Thanks. Link added to post. Looks to be a severe case of imbibing ones own wastewater. Lived the 3 spool dream for to long — forgot that 10 or 15 small victories would soon overcome the rule of physics that was keeping them ahead. Once the penny dropped it was panic stations and half baked solutions all round. Think the TEN and T7000 have a more like XWB type of front of IPC hence not effected by these particular failure modes. RR has a history of developing new versions of engines not meeting expectations, like the RB211-535E4 that superseded the RB211-535C on the 757, The RB211-524 superseded the RB211-22 so the T1000-TEN is just one of them. Makes interesting reading as to how much the issues are shared in the family. The -10 had problems and that in turn delayed the 7000. Only time will tell if it was a one and done or a long term issue that will bite again. A330NEO buyers have no choice, 787s buyers are going to be looking at moving to GE. I can see an A330CEO situation in reverse. Think the -10 had problems discovered in development. Gives flashbacks to the 94″ PW4000 that had big stator segments moving thermally sometimes causing HPC surges before being modified. On most modern Engines you design blisks for the first HPC/IPC stages to be able to swallow more air for a fixed compressor o.d. (HPC raising line design). With blisks you don’t have blade attachment problems but can get into other aero-vibration-acoustic problems. Find problems early is actually good. With the 1000 and its spawn track record, we don’t know if a harbinger or a good catch. XWB has done fine so far, but its also early. Wow. Just wow. When all is said and done, watch these Trent 1000 costs top $1B! EASA and the FAA both strongly need to re-evaluate their certification processes. Maybe they’re going to need to require something along the lines of a year and a half of “hard flying” (12 to 14 hours per day)—six months’ Arctic, six months’ desert, and finished off by six months’ in and out of Japan—before certs. I’m sorry I can’t remember the website I looked at this morning showing disk wear on these engines; the picture would “curl your toes”! And, lastly, ok, I’ll “bite”. 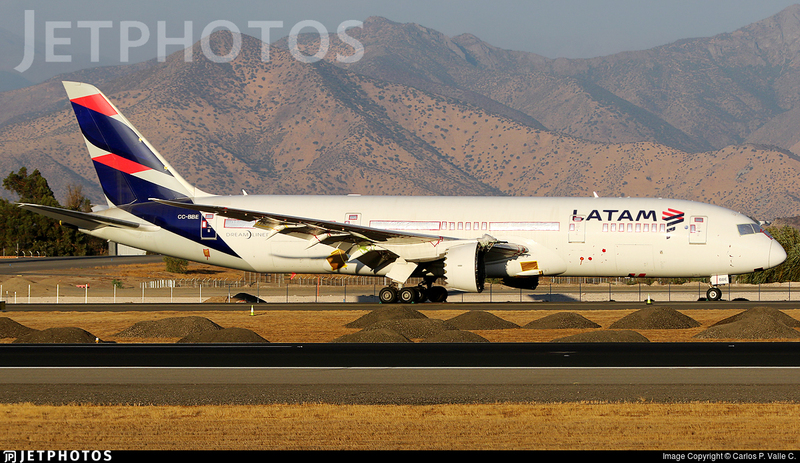 What were 6 LATAM 87s doing in Victorville? Engine service there? Why? I don’t know; however, there is a large aircraft maintenance, storage, and scrapping operation at Victorville. Maybe CAV was the lowest bidder for someone”s storage contract? Thanks much, duke! It’s very helpful. Had to chuckle that LATAM was so adamant about only two a/c there just two months ago. And RR doesn’t just have egg on its face, it’s got the whole southwestern omelet on it—including hot sauce! According to the press release at the link below, Boeing Capital, AOG (Aircraft on Ground), and Flight Test all have operations at Victorville’s Sothern Californai Logistics Airport” (SCLA). SCLA is the former George AFB and its longest runway is 15,050 feet long. Thanks AP_R a mine of info as usual. Would Victorville be a nice place for a final assembly line ? Yep, know one would be looking out the door at the scenery. A/C bill would be a bit on the high side. When does AB jump ship and launch the A330 CEO / NG? Switch to GE engines. Problem solved. No kidding. GE was always the best choice anyway. RR certainly was living on name alone. I wonder if this will get other airlines to jump ship and go with GE. Hasn’t affected (yet) the A350XWB’s which are exclusively powered by RR. Bad problem for RR, wonder what it will take to solve this. Maybe get some 777 back from storage? Must be a good time to be a A330 lessor. While very serious, the icing issue is not the same tech aspects as the RR problems. This is a case where mandatory grounding should be implemented, same as India did on the PW. If this was a GE problem there would be no way the FAA would be doing anything as severe as this. Agreed, as long as you can sneak below the radar, you get a free pass. I’m slightly confused. 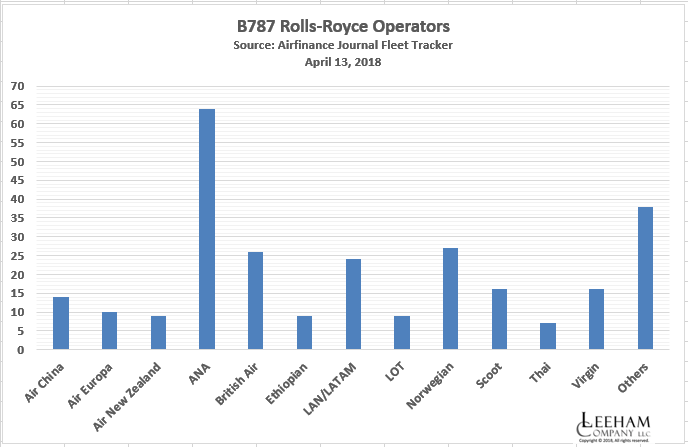 I thought Boeing delivered 670 787s and based on your number that 269 planes are powered by RR which should give ~ 40% of 787 powered by RR instead of 25%. Can you please verify which number is correct ? As per Boeing statement, 787 with Trent 1000 package C are the only one affected (which is about 25% of all 787 delivered). 787 with package B and Trent 1000 TEN are not affected. RR has been scrambling (as was GE) from the start with the fuel burn being lower than guaranteed on the 787. As noted above, some variations have one issue, some the other and possibly both with the last variation (3 Pips). While only one part, P&W ran into that, trying to solve one problem, they created a much worse one. For all reality, the 1000-10 is an all new engine. As I recall, one of the original design features of the 787 was the ability to quickly change between RR and GE engines. After the continuing problems RR has had, at what point does it become desirable for airlines which have a substantial portion of their 787 fleet unavailable to dump their RR engines? It would be a drastic step, but RR seems unable to get their problems under control. While their latest version supposedly doesn’t have the problems which have been grounding aircraft, it hasn’t been on wing long enough to know whether it is really fixed. Wasn’t Package C supposed to fix the problems with Package B? RR powered 787s have been flying for almost 7 years, and they still don’t have their problems solved. At what point do airlines give up on them? As we saw with P&W, sometimes what you fix also makes it worse. The problem with re-engine is that there has to be engines to re-engine to. I think that is vastly overrated short of a lease outfit that might have both engines in service and a pool they can swap around. I have yet to hear that happening. GE is scrambling on the LEAP production, it would take them a year to ramp up the GenX production. Orders down the road can change the engine selection. But that is a couple years out at best. At least its 25% or so unless the whole group gets grounded for all the various issues between the versions. I have been commenting for some time on the RR issues (not just the 1000). I hate snoot, and RR has had a snooty attitude that their 3 spool engines are simply superior in all ways. In my work I have run into that as well though you can replace Caterpillar with RR. Its not a matter of pride in your product, its the arrogance that you get to believe you are somehow superior. RR has long touted that the 3 spool is more efficient (and it has to be to justify the greater complexity ). Axiom in the mechanical world, keep it as simple as possible. That showed itself withe the 1000 when it was even worse on fuel burn than the plebeian 2 spool. Both had pips to correct that. When RR gave up on the 1000 and came out with the -10 (earliest NEO in history of jets anyway) – it was, wow. Kind of like Krakatoa blowing off in the mechanical world. What it means in reality is that RR had to give up on the 1000 because they did not think they could ever fix the fuel burn nor the mechanics. We all know what it costs to bring out an all new engine. GE for their problems improved the fuel burn to spec (last I heard) and other than the ice issue has been reliable. And not so long ago, Emirates and RR announced that the RR was to equip the new buys and it had magically achieved a 5% fuel improvement over the GP7000. I pretty well snorted my beer up my nose over that one. It does not happen without a major revamp and even then you are lucky to get 2% and never 5%. Last out and has no gone quiet, was the RR was having problems with their “improved” Trent 900 for the A380. Clark is not going to admit he made a major mistake (two engines in fleet and the second one not as good as the first one and possibly even worse than what was being offered). No one is touting its success so you can figure its broke even at best or is still worse fuel burn and unknown on mechanical reliability . And what we don’t know is long term did they fix anything with the -10 or will that manifest itself in a few years? Not something to give prospective buyers a warm and fuzzy. And that in turn will affect the 797 offering. Err maybe you guys need to fix what you have first? Big impact on Boeing to divert engines to keep aircraft flying ala Airbus and the A320 gliders. Bye Bye 797 contract for RR! At Engine Americas ’18, the RR marketing person, originally from Hong Kong as introduced, C-level it seems, made one of the most, absolute, incredibly vacuous 12-15min intro presentation i have seen. 7-8 slides of nice pictures. No substance besides ‘we are great’. nada. zilch. Reminded me of some other comm. styles. It does seem that while some hiccups are expected, the T1000s and PW1100s are as close to basket cases as you could get right now and at least on my mind do a good deal of reputational damage to their respective makers. It does call into question long term durability for the -10 and XWB versions since the magnitude of issues only recently surfaced. Is there any possibility that MTU or Safran could become a dominant player in this space vs a program contributor? T seems GE and CFM are the only current players without ongoing significant issues in their new platforms (knock on wood). GE had its problems with the 777 engine but bounced back with its uprated version for the 777-300ER. They too had Etops issues with those early engines. These things go in cycle, RR is hitting a really rough spot. I think arrogance is involved. What should be noted is all engines have issues. While P&W has had their problems (some was producing parts) in the mechanical world a seal is not a big deal to correct. Don’t get me wrong, its a big deal if it blows and stops an engine. Its when its not a quality control problem and is in the DNA of the engine (aka Architecture) that the real ugly begins to rear its head. In this case it was so flawed they came out with an all new engine. P&W is no where close to that. Orders are still coming in for the A320GTF. An all new engine means they don’t think they can fix it, or the fix is an all new process that winds up with an all new engine approach wise anyway. What I find most interesting is that the -10 gets RR just up to snuff, an all new engine normally will get you an easy 5% (and more latter). The take away is that conventional engines are maxed out, shades of Superconnie here. Hopefully P+W can get there act together soon as a changed configuration is, to my mind at least, the only way forward. And ps, there is definately a need to impose new certification requirement on updated parts. Both engine parts and great, great, grandfathered airframes. P+W & RR problems both from parts changes. Seals are easy, lip seals no big deal, combuster is annoying (and of course why) but not fatal. Fatal is when you have to do an all new engine. GE got hit with that, “change”. They changed the coating process on the shaft to industrialize it from the hand done on the test engines. Shed the engine blades out the back due to cracks from the coating process (and very few hours, seldom do they hit that fast). So yes, they are playing engine roulette when they change things and do not do a full cert test. The TEN (not -10) does appear to be a an ‘all new engine’ (as you put it) in the same sense that a 737 MAX is an ‘all new airframe’ but apart from that you appear to me to be off track a bit. Regarding the architecture, the overwhelming percentage of MRO reports I’ve read (possibly all of them) indicate that the 3 shaft architecture has indeed provided better maintenance intervals and less efficiency fall off than competing 2 shaft designs. Not necessarily initial on wing efficiency advantages, especially vs GE’s more aggressive approach to thermal efficiency. Regarding the 1000, 7000, XWB. Back to MRO reports, my recollection is that pre Package C the 1000 were reported to have better reliability than the GEnx. Still, like the GEnx, not where airlines wanted it to be. The XWB also appears to have very good reliability although obviously too early to know what might crop up earlier than expected. 7000 and 1000-TEN, who knows? Trent 900 fuel efficiency. Without knowing what they claim by this (is it initial on wing, is it forecast complete through life, is it forecast post overhaul etc) there is no way to (in)validate the claim. Will be interesting to see if it pans out or not and if it is at the expense of reliability or maintenance costs or not. Which leaves the the Package C 1000. A dog. End of. As for ‘snootiness’ a quick check through reviews at Glassdoor appears to suggest this is likely to be more of a cultural mismatch (eg between US and UK employees) but with a definite element of more senior employees not listening as well as they could or should. Especially a problem with HO. All reports I have read say the GENx was both more reliable, less wear. Note that RR touts the engine as better under 3000 miles. How many 3000 mile flights do 787s make? I think there was a case of the RB211 ultimalye proved to have those benefits. When GE and PW can put together an engine (GP7000) that beats the vaunted 3 spool in all areas, then Houston, we have a problem. As I stated, earliest NEO in history. GE is pushing the conventional limits better. Interesting stuff — the phrase “fat and happy” comes to mind. For long enough RR were the outsiders, placed third in a 2 horse race. And then things changed — first for the better as they used parametric design and variational geometry to work their architecture to the max winning business all along the way. And then they changed again — this time for the worse. RR has made mistakes in the SA marketplace — the desire to be the innovator in the partnership came face to face with reality and then they had to go. As for the TA end of the market — physics wins out. Three spool is a more efficient architecture that two spool. RR got fat and happy because the physics would always keep them out in front. They took their eye of the prize and GE have proved that a good 2 spool can be better than a lazy 3. GE have won a number of small battles all across the patch allowing them to take the lead. However Can they stay in the lead if RR copy or better their host of small advances or do they just work harder and flog their tech / architecture to the max? Will GE stay with 2 for the next round of engines? Or will they copy RR and aim for 2.5 spools where the base physics is better? However RR need a boot up the erse. They have had a poor last decade with little innovation and far too much City friendly financial engineering. Me — I have held a small grudge since they jumped ship from the Tay to the Isar. Don’t have articles handy here so just did a quick Google. As of mid 2015 (ie pre Package C) the Trent 1000 was showing a single IFSD, due to birdstrike. I haven’t seen consumption stats by sector length. Do you have a source for that? Absolutely you pay for ‘added parts’ and more complex systems. Up front. But you also pay for added technology development and insertion (which is what you appear to be claiming GE provided and RR didn’t). Up front. As for maintenance costs, there are some details in the IB Aero PDF but I do recall checking current forecasts (pretty sure I posted a comment about these on an earlier article) which suggested RR parts would cost more but service scheduling would mean lower maintenance costs per flight hour than the GENx. Of course, once any Trent gets old the RR business model can make them pricey. For the GP7200 and Trent 900, IBN Aero in May 2017 (https://www.iba.aero/wp-content/uploads/2017/05/Aircraft-Commerce-May-2017.pdf) show a $5.7-6.5m first SV for the GP7200 at 22,750 EFH compared with a $6.5m first SV for the Trent 900 but at 27,000-32,000 EFH. Obviously specific condition dependent but on this narrow and specific maintenance metric at least the RR appears to have a cost and operational advantage. Really, if you have some sources and data showing what you are claiming re the Trent 1000 and 900 it would be very interesting to see it and learn some more about all of these engines. As things stand though, all I can see is 1000C = dog, others 1000s vs GENx the results depend on when you look, 7000 no way of knowing, XWB looks good and 900 looks (on average) better on at least maintenance. I do have to start filing those findings under a category I can find them. Like the Smoke from the Ten, I can’t find that but it did show up in Wikipedia so someone added it. As Emirates is the only one running large numbers of A380 out of the desert, data is hard to come by for that particular set of circumstances . Etihad and Qatar all went with the GP (see a theme there?) . But it is a very hard environment and the GP had done very well there. But if the RR is going to recover its overhaul costs then it has to return higher fuel burns so they bank the money and ideally more while it wears itself down. No dispatch data reflects the engine changes ANA had to do, NZ and all the rest of the carriers. And the reality is at what cost is the dispatch being maintained? Its really hitting the old GTF now though. Could be the T900 was less suitable as an engine or politically or all sorts of things, so no. Or simply don’t fit a bias against RR? But the data appears to show that, at least with the T900 (even T1000A/B too early I guess), scheduled maintenance $ per flying hour are less than for the competition. The T1000C is a dog. As for engine changes across GENx and T1000A/B, please provide some data. Otherwise, the only available proxies I’m aware of are the ones I referenced and, of those, dispatch reliability clearly does offer at least some reflection on engine changes as many scheduled services will fail to meet dispatch if they require an engine change post previous flight. ATB remains the statistic that appears, to me, to be well worth digging into re all of this, if so inclined. Dang, when you loose an disagreement then you play the political card. Glitches with Rolls-Royce Holdings Plc engines that have dogged Boeing Co.’s 787 wide-body jet are also an issue for the competing A330neo model from Airbus SE. That is where it gets murky. The Trent 7000 is a Trent -10 derivative. As the -10 had to be done before the 7000 could take off from it, the 7000 was held up. Long term, we get to see, the -10 get to be trialed first on the 787. But as this took 4 years to build to the current debacle, it may take a while before we know. No one talks about early wear and tear and issues. You mean their latest large fan engine is a combination of those large fans that went before ? Who would have thought they could be that cunning. Imagine being able to double the BPR from the RR700 that preceded it, how could they do this, it must be wizardry from HR , thats Harry Potter. This is the kind of PR that comes back to bite you! And we are bringing out an all new engine why? I mean the 1000 is the most reliable ………. And the date was (2015?) – they knew they had a dog from the git go. They have included tech from the newer XWB engine. as they say a ‘70%+ part change from the T1000’, why shouldnt they put it on a 787 version that wasnt announced back in 2005. Just repeating all your old tropes doesnt ad to the information. GE did not have to come out with an all new engine. Improved yes, that is common and a life time on going operation. Norwegian is going to retrofit all the 787-9 with the Trent Ten. Keep the Trent 1000 on the 787-8. My take is that the 1000 can’t handle more than the -8 reliably. All versions going forward (787) if they still order them from RR will have the TEN. 75% new is not an updated engine, that is a new engine. What does that even mean ? have you a link that even discusses that . In certification terms there isnt a” Trent 1000 Ten”, its just a marketing term. They are all Trent 1000 ‘A-R’ models. Who was the sole supplier on the A350, which required a new engine, all in thrust ranges outside the GENx. While GEs answer is a small thrust bump for the 787-10.
fair enough they have been flat out with the big new engine for the 777X and the small Leap engine in 2 distinct versions. As we expect GE and its partners will do a good job. The Trent 1000 was so bad and they knew it it never reached the SPC promised, did not beat the GE, did not meet reliability. So they had to come out with an all new engine and the Ten thing is indeed marketing but that is what its publicly known as. Norwegian shiftiness to the Ten on its -9s means that they do not trust the 1000 to meet the -9 thrust levels. The -8 apparently they think it will work for. Its going to cost Norwegian, RR will try to fix the 1000 problems (maybe even succeed). Norwegian obviously is not counting on it. Michael “O”Leary gives free drinks on a flight from Liverpool to Dublin as his horse came first in the Grand national on Saturday . Have you asked the same questions on CFM-7C egines, you know the ones. That keep having the front fan blade break off. Those FAA proposed AD have been pending for a while now. Scott seems to be implying that this is a scandal,the rest of the media seem to be slowly waking up. I dont really understand the situation yet.It would be very interesting to know how many blades that have been inspected have been found to be cracked and obviously had the failed blade been inspected.